Saadani is the only coastal national park in East Africa, which not only means relaxing on Indian Ocean beaches after each safari, but also provides an opportunity to observe Africa's big game and bird life interacting with the sea. Bottled-nosed dolphins are common off the Southern coast of the reserve, whales pass through the Zanzibar channel in October and November, and there is a green turtle breeding beach at Madete in the North. Saadani is the latest national park to be added to Tanzania's already impressive portfolio and has the unique distinction of being East Africa's only coastal wildlife reserve, offering the chance to see big game and bird life interacting with the sea. 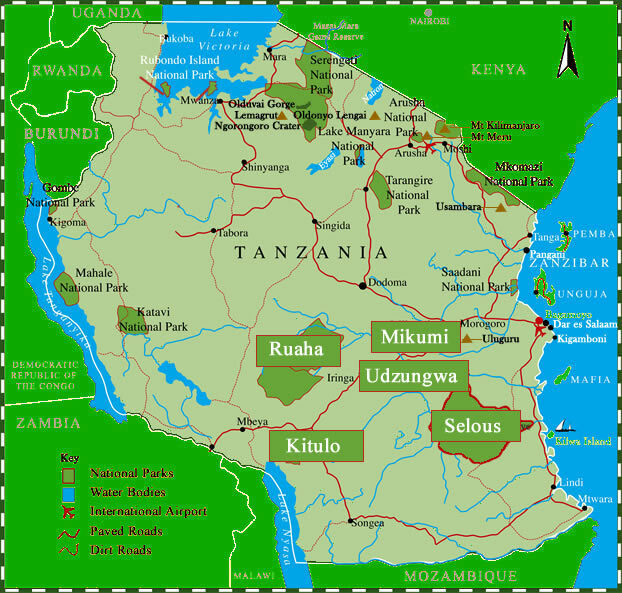 It is located 130kms north of Dar es Salaam, between Bagamoyo and Pangani, and 27kms from Zanzibar, Saadani is the closest wildlife reserve geographically to both tourist centers. There is a wide variety of safari options in Saadani. In addition to the orthodox game drives, boat safaris, walking safaris and bird watching by canoe are also possible. Saadani has a diverse population of birds and mammals including the rare Roosevelt sable. The Southern boundary is marked by the navigable Wami River, which attracts fabulous bird life as well as hippos, crocodiles, black and white colobus monkeys and blue monkeys. A boat safari on the Wami River is billed as one of the highlights of any visit to Saadani. Frequently seen game includes healthy populations of giraffe, buffalo, reedbuck, waterbuck, zebra, Liechtenstein's hartebeest, wildebeest, warthog, baboon and a plethora of bird life. A walking safari is an exciting experience - as the realization of the unknown presence around you is emphasized by every noise, your senses become attuned to your surroundings and you gain a greater appreciation of the environment.